Editor's Note: Take a look also at my conversation with Gary Toth & Hannah Twaddell. In order to get a more complete picture of how well our transportation systems are really serving us, we need to assess their impacts and performance from several perspectives. In this article, we'll explore ways to measure four aspects of community life that depend upon well-functioning transportation systems: (1) mobility -- our need to drive; (2) accessibility -- our need to arrive; (3) livability -- our need to thrive; and (4) sustainability -- our need to survive. Can people and goods move quickly and safely along our corridors, in any type of vehicle -- cars, buses, bikes, wheelchairs -- and on foot? Mobility is, quite simply, the ability to move. We measure it by calculating the speed at which people can travel along a given route. Level of Service (LOS) indicators for highway mobility are the most commonly used measures in transportation planning. If drivers can travel as fast as they desire along a given corridor during the most congested time of day (the "peak hour"), the LOS score is an "A." The slower the traffic moves, the lower the grade. An "F" means gridlock. 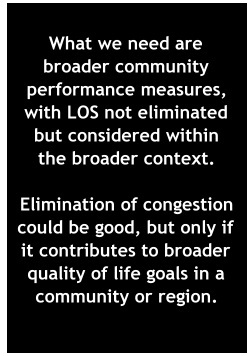 The thresholds for acceptable LOS are, in most communities, based upon long-held transportation agency rules of thumb -- such as maintaining a minimum LOS level of C for all suburban arterials and D for all city streets, regardless of urban context or local land use policies. Agency traffic forecasts for future LOS usually assume the highest possible level of potential development over a 20- or 30-year period. Relying heavily on highway LOS as the dominant indicator for transportation planning tends to encourage ham-fisted solutions to complex problems. As the old saying goes, "to a man with only a hammer, everything looks like a nail." Roadways with poor LOS show up on traffic model maps as red lines. The easiest way to deal with them in the model is to keep adding roadway links and lanes until you "get the red out." But LOS models don't help us consider the adverse impacts that can result from roadway expansion, such as destroying natural areas, bisecting neighborhoods, or affecting pedestrians, bicyclists, or transit riders. In many communities, major arterials have been widened extensively in order to maintain the highest possible LOS at rush hour. But they may sit unused much of the time. Those wide, empty lanes tempt drivers to zoom well above posted speeds most of the day and night. The resulting conditions are dangerous for motorists and downright hostile to bicyclists, pedestrians, and transit riders. Congestion problems can often be solved by simpler, less expensive, and more environmentally sound methods than highway expansion. For example, instead of widening a single congested artery, a community can make the existing system more efficient. Operational improvements such as coordinated signal timing and turning lanes can often go a long way towards clearing up rush hour bottlenecks. Networks of local connector streets can enable travelers to avoid using major arterials, and thus provide more opportunities for pedestrian, bicycle, and transit options. Connectivity refers to the internal networks within a given community, as well as external connections between the community and the larger regional network. The benefits of regional accessibility are strongest in communities with strong internal and external connections. -- illustration from Loudon County, Virginia, Transportation Plan by Renaissance Planning Group. Click on image to view it at larger size. Local community leaders can -- and should -- engage with transportation agencies to customize LOS expectations for different contexts along a given corridor. More importantly, communities need to expand the types of indicators and tools they use for transportation planning. ... article continues with discussion of Accessibility, Livability, and Sustainability.